Why memorize Scripture? Scripture memorization is crucial for (1) victory over sin (Psalm 119:11), (2) for our spiritual growth (1 Peter 2:2), and (3) for knowing the will of God (Romans 12:2). Even Yeshua (Jesus) found it necessary to memorize Scripture. When tempted, He responded by saying “it is written,” (Matthew 4:1-11) then proceeded to quote Scripture. If Yeshua (Jesus) found it necessary to memorize Scriptures, then obviously we need to do the same. So where do we begin? There are over 31,000 verses in the Bible! They are all inspired by God, and therefore worth knowing. But for most of us, it is not at all practical to even consider memorizing 31,000+ verses. So let's keep it simple by selecting 52 verses. That's one for each week of the year. Next, we need to select verses to memorize. With so many passages to choose from, you can simply pick verses that speak to you. However, if you want a list to use as a starting point, I have that for you. I have complied what I consider to be some of the most important verses in the Bible. My list is not the definitive list of verses for memorization. Are there other verses that should also be included? There probably are. Are there verses I could've left off the list? Perhaps there are. However, this is a good starting point. Below you will find stacks of Bible verse flashcards. Click on any card to bring it to the top of the stack. To see the name(s) of the Bible translation(s) used, hover over the reference at the top of the card. When studying Bible passages, I find it helpful to compare several translations. Subtle differences in the wording can do much to clarify the meaning of a verse. The wording of one translation may bring out a shade of meaning not so easily seen a different translation. In addition, the wording of one translation may simply be more natural than that used in a different translation. For instance, do you know anyone who normally speaks in the Shakespearian style Old English used in the King James Version of the Bible? Old English is essentially a foreign language. Why would you read a book written in a language you don't speak? For me it's only logical to use a modern English translation such as the NIV. Many of the verses listed here use the wording of two or more translations. For example, compare the three parallel versions of 1 Peter 5:8 listed below to the composite verse. Notice the composite verse uses words from each of the parallel versions. Keep awake! Watch at all times. The devil is working against you. He is walking around like a hungry lion with his mouth open. He is looking for someone to eat. Be clearheaded and alert at all times. Your enemy, the devil, is on the prowl like a roaring lion, looking for someone to devour. The original languages of the Bible - Hebrew, Aramaic, and Greek - made no distinction between capital and lower-case letters. In Hebrew and Aramaic, all letters were the same. The Greek language did have both capital and lower-case letters. However, the earliest Greek manuscripts were written in ALL CAPITAL LETTERS. In English, we have the luxury of using both capital and lower-case letters. In English, personal pronouns (he, his, etc) are normally written in lower-case. However, in the Bible verses below, I have chosen to use the convention of capitalizing personal pronouns (He, His, etc) when they refer to God the Father, God the Son, or God the Holy Spirit. It's a style choice I use (1) for clarity, and (2) out of reverence. It's my hope that you find the flashcards useful. Enjoy! ...all have sinned and fall short of the glory of God(A). The payment for sin is death, but the gracious gift of God is eternal life in Messiah Yeshua (Christ Jesus) our Lord. God showed His great love for us in this way: While we were still sinners, Christ (the Messiah) died for us. If you acknowledge publicly with your mouth that Yeshua (Jesus) is Lord and trust in your heart that God raised Him from the dead, you will be saved(A). (A) saved from the punishment of sin. God wants everyone to be saved and to fully understand the truth, which is, there is only one God, and there is only one Mediator who can reconcile God and mankind, the man Messiah Yeshua (Christ Jesus), who gave Himself as a ransom to pay for the sins of everyone. Salvation is found in no one else(A), for there is no other Name under heaven given to mankind by which we must be saved. (A) Only Jesus has the power to save! Yeshua (Jesus) said, "I Am the Way, the Truth, and the Life. No one comes to the Father except through Me." I want you to be clear about the gospel... which is of greatest importance! Christ died for our sins, just as the Scriptures said He would. He was buried, and three days later He was raised to life, just as the Scriptures said He would be. ... unless a person is born again from above, he cannot see(A) the kingdom(B) of God. For by grace you have been saved through faith. You did not save yourselves; it was a gift from God. It was not the result of your own efforts, so no one can boast. For God so loved the world that He gave His one and only Son, so that everyone who believes (trusts) in Him will not perish but will have life that lasts forever. The Lord Himself will come down from heaven with a loud command, with the voice of the archangel, and with the trumpet call of God, and the dead in Christ will rise first. Then we who are still alive will be suddenly caught up together with them in the clouds to meet the Lord in the air. And so we will be with the Lord forever. Not all of us will die! But we will all be changed - in a moment, in the blink of an eye, at the final trumpet. The trumpet will sound, and the dead will be raised to live forever, and we too will be changed. In My Father's house there are many places to live. If it were not so, would I have told you that I am going there to prepare a place for you? And if I go and prepare a place for you, I will come again and take you with me; so that where I am, there you may be also. (A) who treat you with contempt, or who harm you. (B) The promise here is given to Abraham. However, this same statement is given concerning Abraham's descendants - the Jewish people (see Genesis 26:3-4; 27:29; 28:13-15). Anyone who harms you(A) harms the apple of My eye(B). No temptation(A) has taken hold of you except what is common to mankind. But God can be trusted—He will not allow you to be tempted beyond what you can handle. But when you are tempted, He will also provide a way of escape, so that you can endure it. (A) The Greek for temptation and tempted can also mean testing and tested. I have hidden(A) Your word in my heart so that I won't sin against You. If we confess our sins, then, since He is faithful and righteous, He will forgive us our sins and cleanse us from all unrighteousness. This is the day that the Lord(A) has made(B). We will rejoice and be glad in it! Always treat others as you want them to treat you. This sums up the teaching of the Law of Moses(A) and the Prophets. Continue to remember the Lord's people who are in prison and being mistreated. Remember them as if you were in prison with them and suffering with them. Whether you eat or drink, or whatever you do, in word or deed, do it all so as to bring glory to God, and do it all in the name(A) of the Lord Yeshua (Jesus), giving thanks to God the Father through Him. "You are worthy, our Lord and God, to receive glory and honor and power, because You created all things. It is by Your will that they existed and were created." In six days the Lord (Yahweh) made the heavens and the earth, the sea, and all that is in them, but on the seventh day He rested. Therefore the Lord blessed the Sabbath day and made it holy(A). In the beginning was the one who is called the Word(A). The Word was with God(B) and was truly God. From the very beginning the Word was with God. And with this Word, God created all things. Nothing was made without the Word... The Word became flesh(C) and lived among us. We saw His glory, the glory of the one and only Son of the Father—and He was full of grace and truth. In the beginning God created(A) the heavens and the earth(B). Always be joyful. Never stop praying. Whatever happens, always be thankful. This is what God wants from you who are in Messiah Yeshua (Christ Jesus). Do not conform to the pattern of this world, but be transformed by the renewing of your mind(A). Then you will be able to determine what God wants for you; you will know His good, pleasing and perfect will. (A) change the way you think. ... all that the Lord (Yahweh) your God asks of you is to fear the Lord your God, to live in a way that pleases Him, to love Him, to serve the Lord your God with all your heart and with all your soul, and to always obey the Lord's commands and rules, which are for your own good. Fear(A) God and obey His commands, for this is everyone's duty(B). Pray for kings(A) and for everyone who has authority over us, so that we may live quiet and peaceful lives as we worship and honor God. Never worry about anything; on the contrary, pray and ask God for everything you need, always giving thanks for what you have. ...if My people who are called by My name, will humble themselves and pray and seek My face and turn from their wicked ways, then I will hear them in heaven, and I will forgive their sin and will heal their land. We know that God causes everything to work together for the good of those who love God. They are the ones God has chosen for His purpose. Trust in the Lord(A) with all your heart and lean not on your own understanding. Acknowledge Him in all your ways, and He will make your paths straight. I am not ashamed of the gospel of Christ, because it is the power of God that brings salvation to everyone who believes: to the Jew first(A) and to the Gentile also(B). There is no difference between Jews and Gentiles. They all have the same Lord, who richly blesses all who call on Him. So then, "Everyone who calls on the name of the Lord will be saved." "You are to have no gods other than Me. "You must not misuseA the name of the Lord (Yahweh) your God. "Do not tell lies about your neighbor. "Do not covetB anything that belongs to your neighbor." (A) misuse - treating His name as anything less than sacred, including breaking promises, telling lies after swearing to tell the truth, using the Lord's name as a curse word or a magic formula, and trying to control the Lord by using His name. Love the Lord your God with all your heart, with all your soul (and being), with all your mind (and understanding), with all your strength (and might and resources), and love your neighbor, as you love yourself. There is no commandment greater than these. Go and make disciples of all nations, baptizing them in the name of the Father and of the Son and of the Holy Spirit, teaching them to observe all things that I commanded you. And remember, I am with you always, even to the end of this present age(A). Give thanks to the Lord (Yahweh), for He is good; His loveA endures forever. Always be ready to give a logical defense to anyone who asks you to give the reason for the confidenceA in God that you have. But do this with gentleness and respect. My thoughts are not your thoughts, and your ways are not My ways, declares the Lord(A). Just as the heavens are higher than the earth, so are My ways higher than your ways, and My thoughts higher than your thoughts. Man does not live on breadA alone, but onB every word that comes from the mouth of God. Without faith it is impossible to please God, because anyone who comes to God must believe that He exists and that He rewards those who diligently seek Him. ...blessed are those who hear the word of God and obey(A) it. Seek first(A) the kingdom of God and what God wants. Then all your other needs will be met as well. 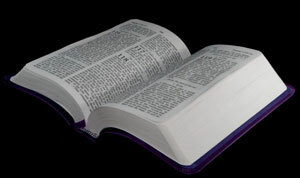 The purpose of this site is to (1) "contend for the faith" by expounding the fundamentals of the Christianity, including the Biblical doctrine of creation, (2) to make known the plight of Christians worldwide persecuted for their faith, (3) to examine the Hebraic roots of the Christian faith, and (4) to explore other topics that shape the worldview and lifestyle of ordinary followers of Yeshua (Jesus).